If you are training for a half marathon (or even a full one), you may want to consider entering a few shorter races to help you with your training. Whether you are new to running, want to run longer distances or want to improve your previous times, racing can be used to improve your performance. I would recommend doing at least one 10K race, and if you are a beginner a 5K race might be beneficial before even doing this. I would suggest that you do a 10K race about 4 weeks before your actual half marathon, and that all race distances you should feel comfortable with. If you haven't raced before it can be daunting to see all these other runners who seem quite comfortable waiting for the starting signal. There will be runners with better running shoes, bigger calf muscles, fancy Garmin watches, slimmer waistlines, club jackets and more brightly coloured tops. Do not let any of this worry you.. You will soon learn that when everyone sets off , it's just you and your run. No one will be judging you, they will only be concentrating on their own race. Everyone has their own goal, and everyone will have respect for you for running to achieve yours. Even if it is just to be able to complete a 5K or 10K, they will respect you just for being there. You will soon get used to running with people, finding your own pace while others pass you, or you overtake them. You don't have to try and keep with everyone at the start, and running a smaller race first is a better way to learn this, rather than on the day of your main event. When we run on our own, we become immersed in our own times and performances. You may start to think that you aren't near the level you could be, or that your training hasn't been going as well as it should. Finishing a 10K race will boost your confidence, knowing that you can complete at least half of the distance with plenty of weeks still left to train. Even if a 10K race doesn't go as well as you hoped, you can use it to see what went wrong and make adjustments in your training, knowing that this problem has been addressed. I said earlier to run at least one race, but if possible try to include two or three. This means that any problems found in the first race can be improved for the next race, and by the time the half marathon comes they will be nothing to worry about. You don't have to practice your race pace (it can be just a good way to get used to taking part in a race and take it easy), but races are an ideal place to get some fine tuning done. The first mile can be tricky to get your ideal pace because of the number of people around you, but after this I would recommend running at your half marathon race pace. Since it's a shorter distance, you could run the last mile or two slightly faster, improving both your speed and your confidence. But that is completely up to you and how you feel on the day. You will have done this plenty of times on your long runs, but it can be a good way to test everything in racing conditions. You will probably be running with a race number and a timing chip, so this will allow you to make sure you are comfortable with these. Racing also differs from just going out for a training run as you will be spending time waiting for it to start. It's not a case of just leaving the house and beginning to run. You may have to spend 30 - 60 minutes waiting and keeping warm. What top or jacket do you bring? Do you warm up with shorts on or a tracksuit? Race days will help answer these questions. Races are a great way to push yourself more than you usually would if you were just out for a normal training run. I'll use my last race for an example: There was a hill that brought us to over 500 ft that I know that I would have walked up, had I just been on my own. But being surrounded by fellow runners and knowing that there is a clock ticking helped me run the whole way up. The adrenaline may have helped a bit too, but I know I would not have kept running if it as just a training session. You can bring these experiences back to your training. I was running a few hills this morning, and they seemed a lot easier because in my mind I knew I had faced and conquered a much tougher hill racing last week. You should find that in races you can go that bit extra in either speed, distance or climbs. And when you do, you will improve both physically and mentally, which you can take back to your training. I covered quite a bit of this in my The Week Before The Race post, but the practical preparations can be improved with practice. You should be using your long runs as practice runs for your main event, using the same gear, energy gels and clothing on every long run so you will be used to them on the big day. These races will help prepare for actual racing. I had a race a few weeks ago where I forgot to bring safety pins. In the end it was ok, as they provided them in the race pack. But I should have been prepared. I did not, however, remember to bring my Vaseline. That hurt.. It's more about the small things. What do you wear to the race, do you need to change into your running gear? Are you going to wear headphones during a race? When the race starts will you have headphones, mp3, GPS, or your watch to fiddle about with before you start running? It's better to practice this sort of stuff on smaller races. Training plans for a half marathon can be anywhere between 8 to 14 weeks, and it can be easy to lose focus over such a long time. Having races like this gives you smaller goals within your plan, and also lets you assess how your training is going. Running on the roads on your own can get monotonous for some people, so breaking it up with races helps you keep focus at the early stages. Personally I love 10K trail races, as they offer something completely different to road running. They also provide a tougher terrain and usually plenty of hills too, all of which will help your training. Not only that, but it can be fun racing round mountains, over streams and through muddy forests. Try and find some in your area as they can be great fun. 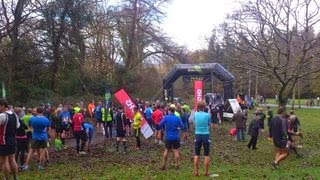 About a month ago I was taking part in my first 10K in a while at the Born 2 Run Tollymore Trail. I started too fast and by the time I was at mile 3, I was in pieces and ended up walking for a while. I learned from this, and in the next race I started slowly and finished fast. With a big improvement on my time. These smaller races are ideal places to learn these sorts of mistakes. It was better this happened during a 10K race than on my half marathon attempt. So any mistakes you do make during these races, use them as a positive. Write down what you did, how it effected your race and how you will fix it so it won't happen in your next race. Every mistake you make is an opportunity to improve your racing, as long as you learn from it. Don't race too close to your half marathon date. I would recommend finishing races at least 4 weeks before the big day. Don't race over 10K as you may push yourself too much, resulting in over-training which will effect your remaining training plan. Race instead of doing your long or tempo run, don't try and do all three in the same week, as again this can lead to over-training. If you race on the Saturday, try and do your tempo or long run midweek. Remember this is part of training for a half marathon, it's not just about the shorter race. So don't push yourself to the point of getting injured or burned out. You should also include a cool down, ice bath, foam roller session and post run recovery meal to make sure you are ready for your next training session. Give yourself a day off from training if needed. Use it to control the variables you can control, such as pre-race warm up, taking energy gels, hydration and clothing. You want to be going into your half marathon race with all these things rehearsed so you are comfortable with them. Don't race more than 3 times during your training programme. Not only will you increase the chance of over-training, your schedule may also start to suffer. Remember racing is just part of the training, not the end goal here. Don't worry about getting personal bests in these shorter races. If they happen, they happen, but these races should only be used as training. The big goal is finishing the half marathon, not getting a few seconds off a 3 mile race.